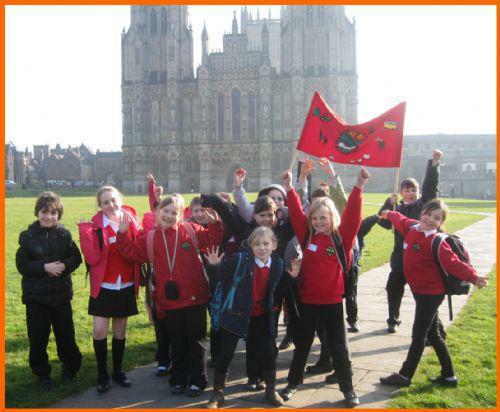 On Tuesday 5 March Year 4 travelled on a 'pilgrimage' to Wells Cathedral for the annual Leavers Day for all Year 4 children in the Diocese of Bath and Wells. We had a fantastic day exploring the Cathedral and taking part in workshops on craft, music and mime. We made special boxes on a tour of the Cathedral which we were able to take back to school with us. We enjoyed singing hymns and reading prayers in a service. Jake Butterworth read a prayer which we had written at school especially for the service. Ben Summersgill and Alfie Miles carried the banner in the service and Katelynn Bellamy and Georgia Sondgen-Brown received a candle, which is a gift from the Cathedral and which we will now use in our assemblies.